It is hard to resist recalling our own shameful denials of Jesus as we read of Peter’s, but resist we must. After all, there is a greater truth to recollect than our sinfulness. John’s gospel of Jesus’ unbounded love consistently rehearses that truth, just as Paul’s epistle does. Today’s gospel reading is an interjection into the account of our Lord’s loving passion and death. It serves as a footnote for the glorious finale of Jesus hosting a post-Easter seaside breakfast where Peter was singled out as the principle guest (John 21:9-17). Surely Jesus was disappointed with Peter’s denial that produced tears of shame. 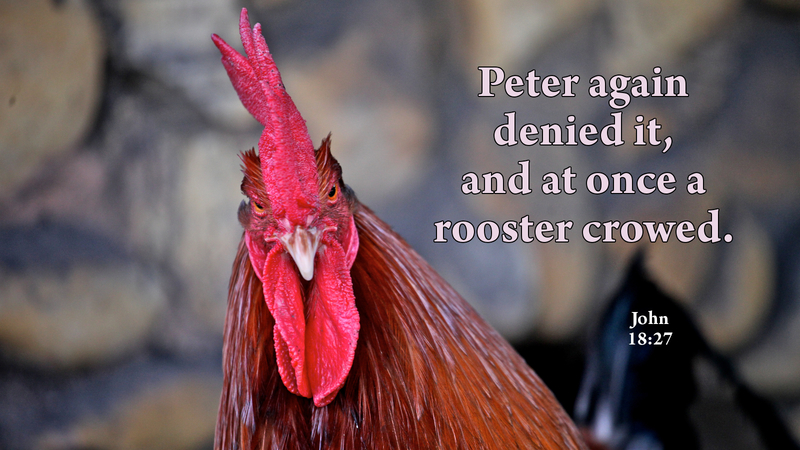 Likewise, we are shamefully uncomfortable as our Lord turns to look at us whenever we are awakened by a “rooster.” We fear its announcement of a day of reckoning. However, John did not a tattletale on his friend in order to wake us to repentance. Rather, at the dawning of shame, he would have us remember Peter’s breakfast experience, daring us to believe our Lord’s infinite love. Embarrassment should give way to boldly reaffirming our love for the one who came to love. Rather than being undone by fear and shame, faith recalls every morning as God’s gift of love. Prayer: Father, with your Son, awaken us each morning to your love, and by your Spirit, to professions of loving you in others. Amen. Today’s devotion was written by Eugen Lehrke, retired NALC Pastor.